One of the top global stories in the past week was the claim by Chinese scientist He Jiankui (贺建奎) to have successfully a healthy pair of twin girls in China using gene editing technology — a claim that quickly drew condemnation from the scientific community both in China and across the world. But for a very brief period in time, this story was pushed in the Chinese media as a major “breakthrough” for science and for China. 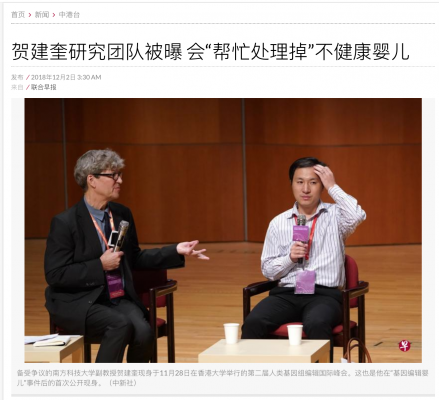 According to one expert, early coverage by People’s Daily Online ahead of a scheduled presentation by He Jiankui at the University of Hong Kong suggested that there had been some coordination between He and state media. Another major media story to NOT get adequate coverage in the Chinese media due to its sensitivity is the apparent detention in Xinjiang of award-winning Chinese photographer Lu Guang (卢广). In other media news, we have continued pain and disruption in the traditional media space, with the announced closure of both the Legal Mirror (法制晚报), launched in May 2004, and Guangzhou Metro Daily (羊城地铁报), China’s first newspaper created for circulation on the subway system. Finally, we have signs of China’s intensified push of its film culture through Southeast Asia, with screenings in the Myanmar countryside of such nationalistic state films as Wolf Warrior 2. 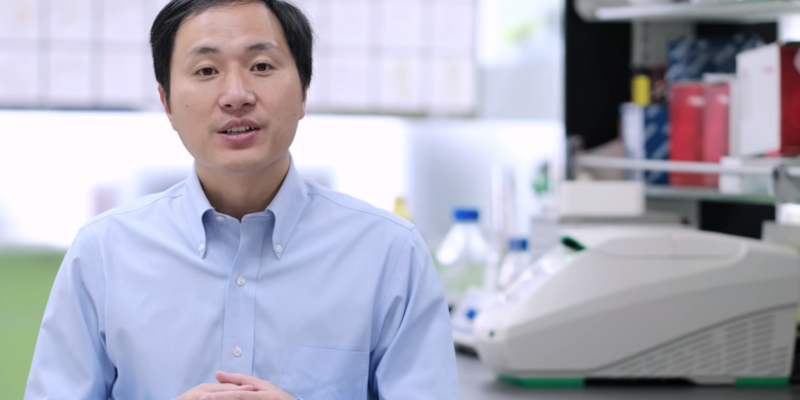 On November 25, Chinese scientist He Jiankui (贺建奎), an assistant professor in the biology department at Southern University of Science and Technology in Shenzhen, announced in an English-language video posted to his YouTube account, “The He Lab,” that he had successfully created a set of twin girls using gene editing technology, the world’s first. Soon after the video surfaced, the news traveled through Twitter and was quickly picked up by international media, with many raising serious doubts about the ethical implications of the application of such technology, particularly without oversight. At 10:51AM on November 26, The Shenzhen channel of People’s Daily Online ran a report called “World’s First Babies Edited Without AIDS Gene Born in China” (世界首例免疫艾滋病的基因编辑婴儿在中国诞生). The report, which largely took a positive attitude toward the news, and which called it an “historic breakthrough” (历史性突破), was later removed from the internet. The report was initially cross-shared by many Chinese news sites, including Caijing Online (财经网), Guancha.cn (观察者网), The Paper (澎湃新闻), Tencent Science and Technology (腾讯科技) and Sina News (新浪新闻). Singapore’s Lianhe Zaobao reports on the growing scandal surrounding He Jiankui’s claims of gene editing. Image: He faces questioning from a panel during an event at the University of Hong Kong. Also on November 26, He Jiankui received a joint letter from more than 100 scientists from the biomedical community in China, saying that his use of CRISPR-Cas9 technology to genetically edit human embryos was dangerous and unethical, and damaged the reputation of China’s scientific community. On November 27, China’s Science and Technology Daily (科技日报) questioned in a report whether He Jiankui’s “prohibition breaking” (犯禁) experiment had actually achieved what . he said it had. “This is not clear,” it said, “but we can be clear about two things. First, too little information has been made available by the scientist and by approval authorities, and there is no way yet to prove whether the conduct was responsible. Second, scientific exploration cannot disregard principles and approvals, and it is wrong to spoil things through excessive enthusiasm” 拔苗助长). “In my view, this is something that should be affirmed,” Zhang added. The screenshot to the left shows the top three results on Google for a search of the headline of the original People’s Daily Online report on He Jiankui’s “breakthrough.” The first result, the link to the original People’s Daily Online story on the “Guangdong channel” of the site, is no longer available, yielding a 404 Error. 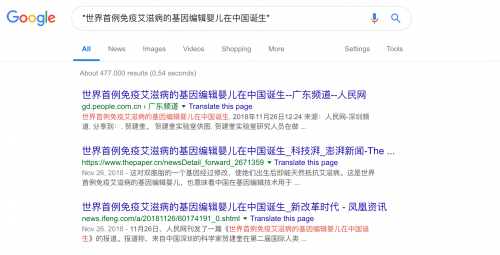 The third link, the People’s Daily Online story shared at Phoenix Online, is also now unreachable, sending readers instead to the site’s homepage. Overseas media and human rights groups reported this week that Chinese photographer Lu Guang (卢广), an award-winning photographer who has worked for years recording the lives of people on the margins of society, has been missing for more than three weeks, since arriving in the northwestern region of Xinjiang in October to take part in a photography dialogue. Lu’s family lost contact with him on the evening of November 3. His wife, Xu Xiaoli (徐小莉) says she has not received any notice or documentation whatsoever concerning her husband, but authorities in Yongkang, Zhejiang province, where Lu Guang has his identity registration, have confirmed that he has been taken away by local authorities in Xinjiang. 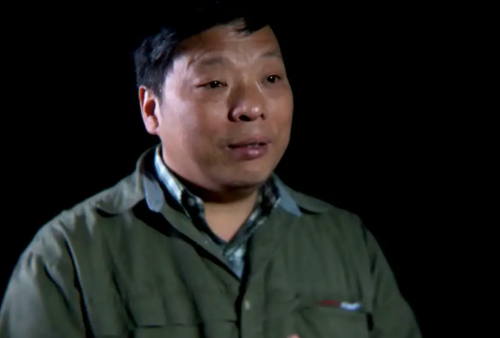 Lu Guang is pictured in a video after winning a World Press Photo award in 2011. This was reportedly Lu’s first trip to Xinjiang, where in recent months the government has imposed a highly repressive control regime, detaining hundreds of thousands of ethnic Uighurs and Kazakhs in special camps in what it has rationalised as a broad security and anti-terrorism campaign. Media in mainland China did not report on Lu’s case, although it was mentioned on a number of public accounts on WeChat and on social media. Lu Guang previously worked as a manufacturing worker, and later set up a photography studio and advertising company. In 1980 he began doing photography in his spare time, and in August 1993 he went to Beijing to study photography at the Central Academy of Fine Arts. Lu, a three time World Press Photo winner, is also reportedly the holder of a U.S. green card. The Legal Mirror (法制晚报), launched in May 2004 as a newspaper focussed on legal affairs, announced this week that it would cease publication on January 1, 2019. The newspaper’s editorial team will be merged with the editorial team of its mother publication, Beijing Youth Daily (北京青年报), the official publication of the Beijing chapter of the Chinese Communist Youth League, where they will be tasked with the development of a new convergence media platform (融媒体平台) under the Beijing Youth Daily flagship — the “Beijing Lead Story” (北京头条) news app. “Beijing Lead Story” is planned as a multi-function news app drawing together various resources from the Beijing Youth Daily, with a focus on news and information, and also hosting video, self-media (自媒体), online commerce and other services. Launch of the app is expected soon. Also this week, China’s first newspaper for the circulation on a subway system, Guangzhou Metro Daily (羊城地铁报), announced that it would close its doors this month in order to undergo “comprehensive transformation” (全面转型). In a video accompanying an article in the Global Times, a sound technician from Myanmar explains the process of readying Chinese films for local audiences. The Global Times reported this week on a tour of Chinese films through Southeast Asia as part of the 2018 Chinese Film Festival’s “Mekong Journey of Chinese Film” (中国电影的澜湄之旅). The films, including Wolf Warrior 2 (战狼2), Operation Red Sea (红海行动), both highly nationalistic films produced by the state film industry, and Never Say Die (羞羞的铁拳), a comedy, are reportedly now being screened at village locations throughout Myanmar. This is the first time that screenings of Chinese films have been organised in Myanmar’s countryside, with free-of-charge open air screening. Wolf Warrior 2 and Operation Red Sea, both of which openly advertise China’s military strength, have been regarded as a sign of the emergence of a new strain of nationalism in China, one that is more confident about China’s role and strength globally. Since 2017, numerous Chinese film events have been held in Rangoon, Naypyidaw and other major cities in Myanmar. On November 29, a notice called “Hengdian Studios Meeting Details” (横店工作室会议内容) surfaced online and set off a storm of discussion in China’s film community. 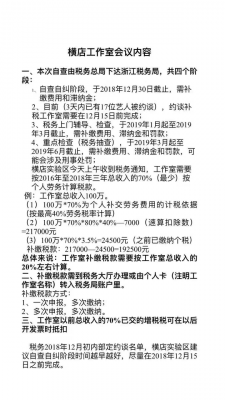 The notice revealed that Hengdian Studios, China’s largest film and television shooting base, had received a notice from national tax authorities saying that companies and performers working there must pay taxes amounting to roughly 20 percent of gross revenues for the years 2016-2018. Beijing Business Today (北京商报) quoted an anonymous source from the studios saying that the taxes previously paid by the studio had been low because the local government had provided investment promotion policies, including tax benefits. The studios, the source said, had not evaded taxes, and this tax notice was essentially a nullification of the previous policies, demanding that the studio business pay one-off retroactive tax payments on the basis of the new policy. Yang Zhiyong (杨志勇), a researcher at the National Academy of Economic Strategy (财经战略研究院) in the Chinese Academy of Social Sciences, said that the notice now suggests that local governments do not in fact have the power to offer tax incentives as an attraction to businesses. Similar news of tax demands from national authorities surfaced in the film community back in September this year. WeChat public account “Shangguan News” (上观新闻): 多家影视工作室接补税通知？17名艺人被约谈？来看看国税总局怎么说?